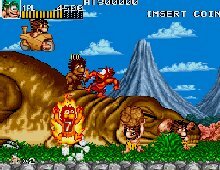 A great conversion from the hit arcade game of the same name, Joe and Mac: Caveman Ninja is a fun platform game starring two bumbling cavemen, Joe and Mac. After their “cave-babes” were kidnapped by rival gangs of Neanderthals, the cavemen ninja decide to strike back. Armed with a variety of Stone Age projectile weapons, the two will fight their way, with your help, through six levels of jungle adventures, facing threats from nasty cavemen, angry bees, giant plants and more dinosaurs than you can shake a petrified stick at. Joe and Mac begin the game armed with stone axes, but by cracking open eggs left by defeated pterodactyls along the way, the two can upgrade their arsenal. The caveman ninjas have mastered the art of combat, fighting with fireballs, wheels, boomerangs and even powerful doppelgangers of themselves. For a more powerful blow, you could hold down the attack button to make Joe and Mac swing their arms around wildly, building up energy (at least until they got tired). Regardless of what's threatening them, Joe and Mac never lose their sense of humor. The game is peppered with funny little touches – from the goofy cartoon graphics to the comic sound effects. The combination of traditional platform gaming and silly antics made Caveman Ninja a favorite of many in the arcades, leading to a successful follow-up, Joe & Mac Return, in 1994, which unfortunately was never translated to the PC. Highly recommended!